When people are dispersed over the world, and the Internet is the only connection between them, creating a game where many people can play together is tricky. The idea behind an open online game is that it draws people in with a low entry barrier and helps them discover or forge new connections. 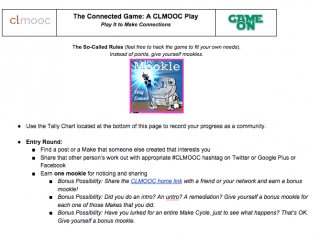 With a collaborative document such as Google Docs or Hackpad, you can design a game with ideas built around a connected scavenger hunt. Inclusion of a simple tally sheet provides a sense of community, even if the score itself is not the point. This kind of open online game can be easily launched and hosted and played.